Two young women, murdered in their homes, forty years apart. Their deaths have the it-can't-happen-here horror that tears into the heart of a community, in this case, the small Southern town of Piedmont, North Carolina. The two families aggrieved by the first murder suffer again with the second--and find that four decades are not enough for healing. When the old scars are torn off by the second murder, the pain of each is magnified. 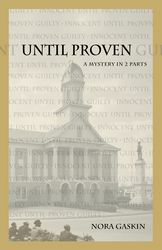 Until Proven: A Mystery In 2 Parts is a mystery, a family saga, and an examination of how a community changes. Or doesn't. Reviews: “All families have secrets. Some Southern families seem to have more than most or keep them closer, tighter, longer. 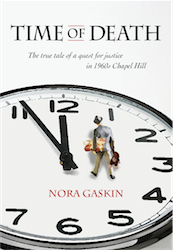 Nora Gaskin writes of times and situations that hold you fast to your chair, pull you to places and into people’s lives that linger long after the last page. Move over John Grisham, here’s a story with legal complications, that has heart. Gaskin writes a graceful prose that spills magic like the silver in mercury. She knows this world, of court rooms, clients, wrongful charges, and the wrecks of mistakes.” - Ruth Moose, poet and short story writer, including Neighbors and Other Strangers. “Two murders a generation apart entangle two families: one white and entrenched in the leadership class of the North Carolina city in which both live; the other African American and closely involved in the civil rights struggles of their time and place. Nora Gaskin’s Until Proven is a page-turner of a double mystery, and much of that is due to the characters and relationships Gaskin brings to life. Attorney Colin Phillips, retired domestic employee Marie Minton, and their two complex families are closely and believably drawn. Both families are deeply embroiled in events that leave none of their members unchanged. They will remain in my memory. Gaskin has a fine sense of the time, the place, and the people, and as a reader, I was thoroughly involved. I know others who like substance in a mystery will be too.” - Joyce Allen, author of Hannah’s House and Those Who Hold the Threads.